I will preface by saying this pack contains no makers markings, tags or labels. 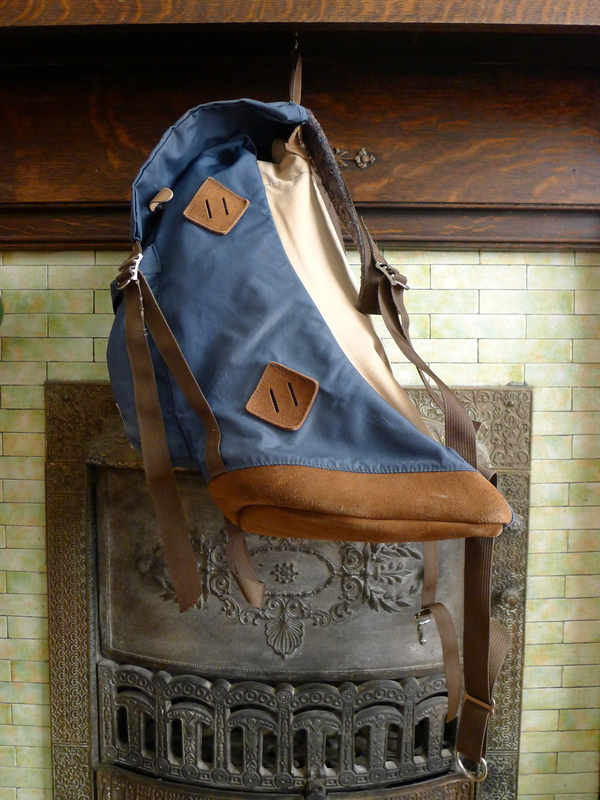 It is believed to be from early outdoor gear manufacturer Gerry based on certain characteristics. It wasn’t until the end of the second World War, when GIs returning from the European campaign settled rejoined the fabric of american life that outdoor exploration as a true hobby and leisure exercise really begin to gain a foothold in the United States. campaigns in the Alps and Pyrenees along with exposure to cultures that had survived and thrived in these areas provided some soldiers with a taste for the alpine life when their tour was over. 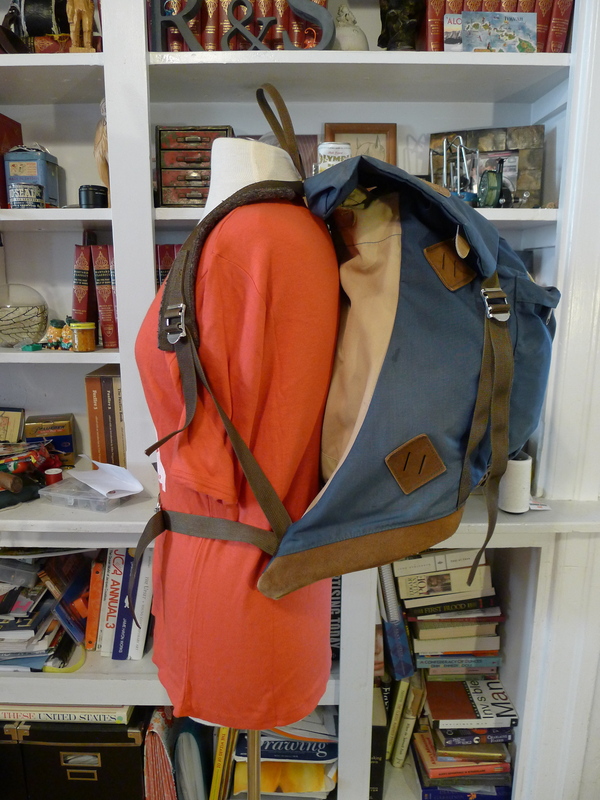 Purpose built military gear provided the basis for these new adventure’s kit. Modifications for civilian use at some point became drastic enough that an entirely new piece of equipment was created and their creators found business in doing so. In this pack you can see the lineage of its predecessors. Even with in this blog you can find examples of Swiss and other military packs of which this bag shares many characteristics. Heavy canvas has been replaced by lighter nylon blended material and excess hardware associated with military use has been eliminated. 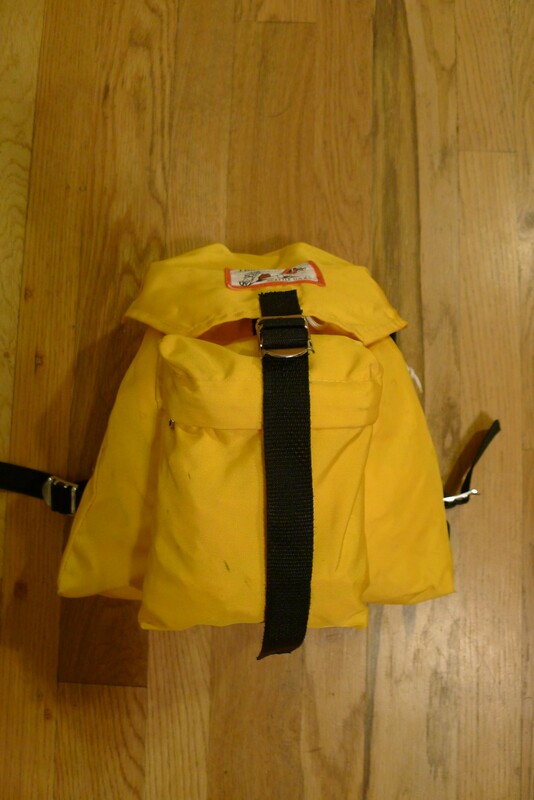 The items that work remain; leather shoulder straps affixed with nuts and screws, main compartment with external pockets for stowing items that need be readily available. And OD Green, hey, it works and why would anyone want to stray from earth tones any way? This pack’s tear drop shape, side compartments and top flap are consistent with another pack designed by the Gerry company in the early 60s featured on this blog here. 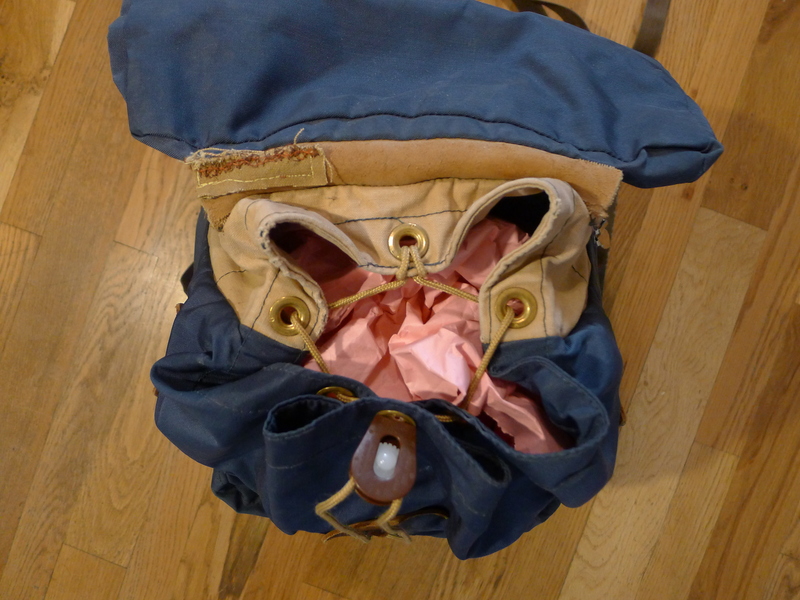 In particular the way the top flap is secured by cords through nylon lashings and knotted. Gerry’s Gerry Cunningham was one of the earliest designer and manufacturer of commercial mountaineering and outdoor goods starting the company in 1946 after leaving the military. Since that time the company has gone through many changes and owners. Its most current incarnation can be seen at www.gerryoutdoors.com. 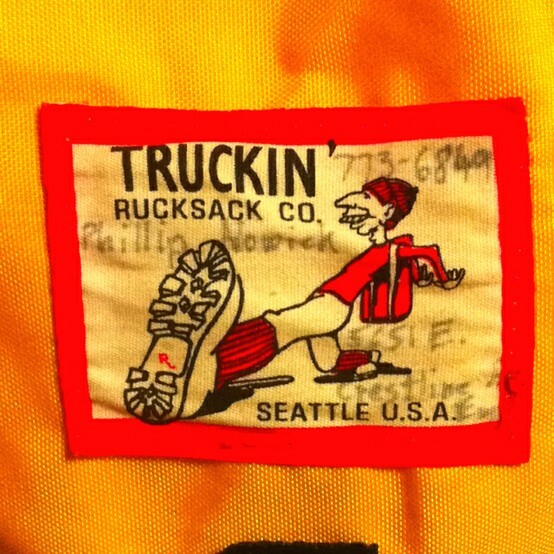 Truckin’ Rucksack Co. Seattle Washington U.S.A. 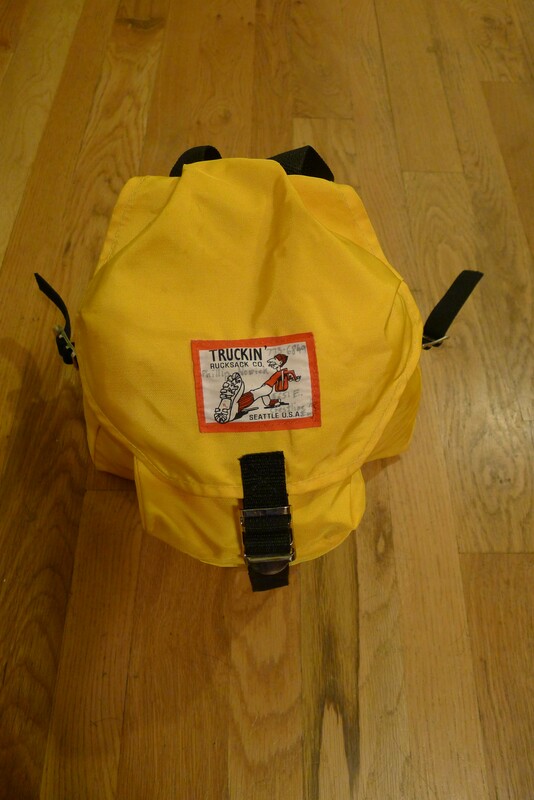 Unique small rucksack by Truckin’ Rucksack Co of Seattle Washington USA. 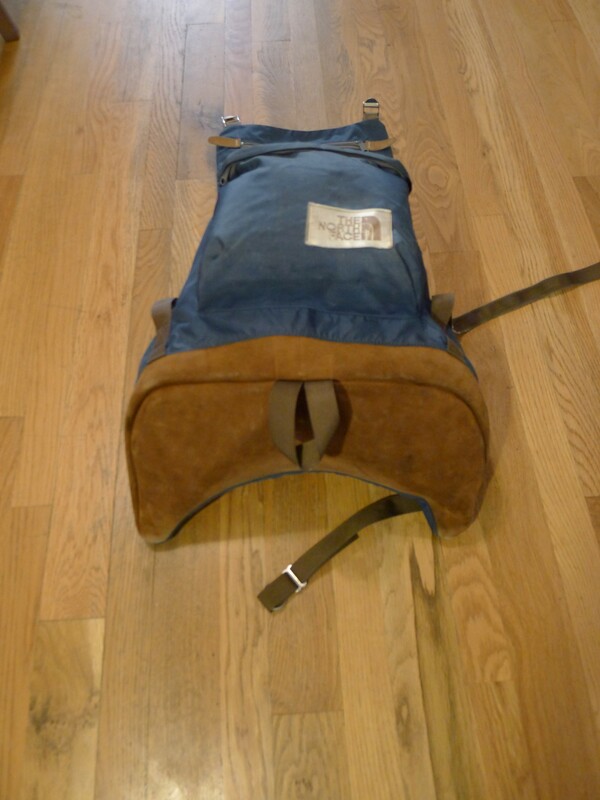 Wish I had more details on the company and the origin of this bag, but I don’t and have not found anything out there. I’ve seen similar packs from unknown companies made in Japan but they always seem to be of a little inferior quality to this bag. 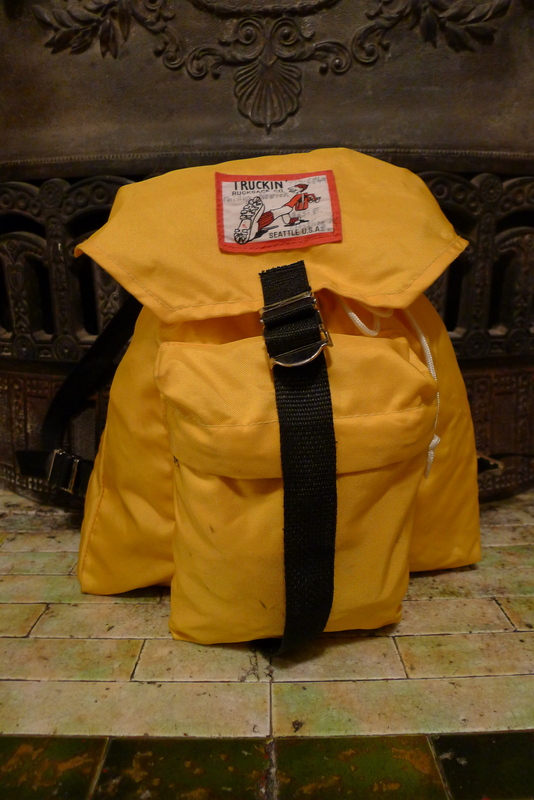 This ruck sack is very small, almost child size, but such as the label depiction suggests, my guess is that it’s just intended to be used as a small day pack on backpacking trips. 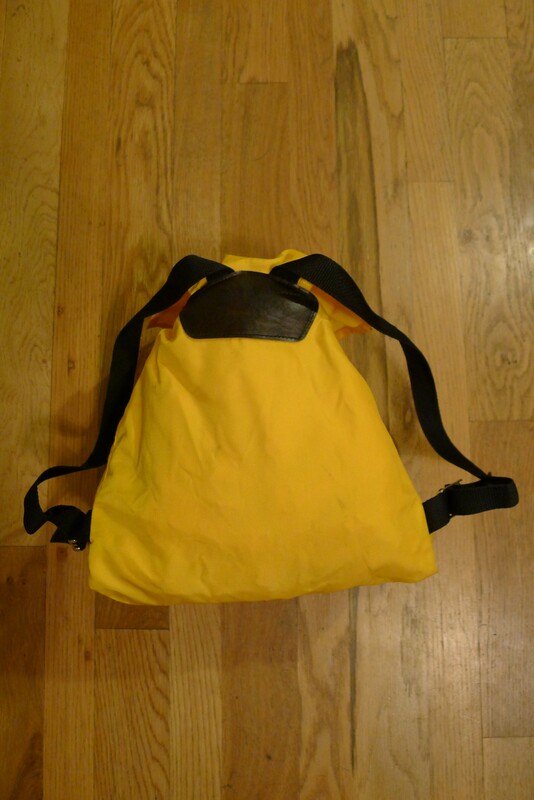 The nylon bag is coated on the inside with a poly urethane or similar rubberized substance for waterproofing. 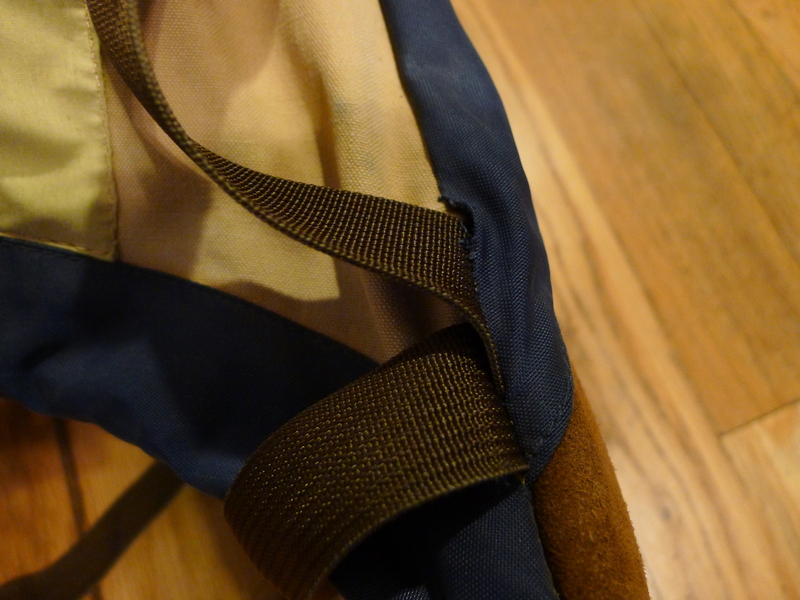 The main compartment of the bag is made from a single piece of material with two wedges inserted on the side. 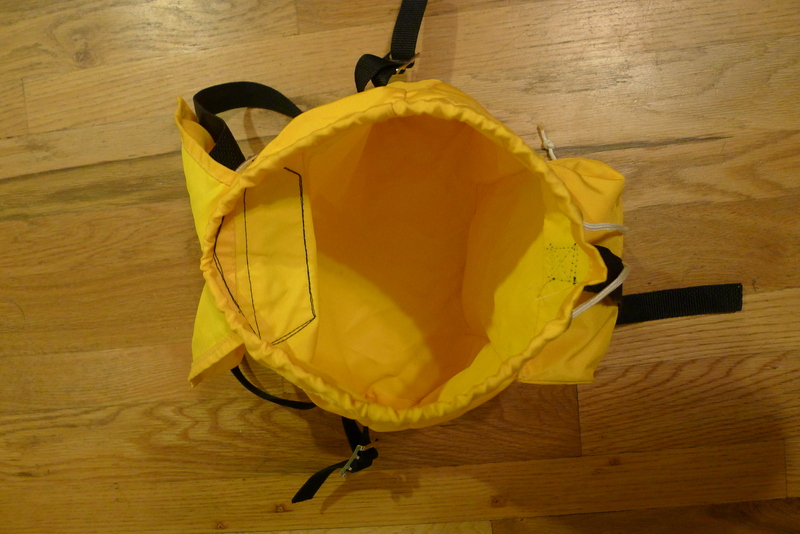 One decent sized zip closed canister pocket lives on the outside. Top draw string and flap closure. 7/8 inch wide nylon straps are gusseted with a piece of brown vinyl. The label is screened on a cotton blend patch. This one bears the previous owners info. Not quite sure about the origins of this pack, the colors would suggest to me German military, but the only distinguishable marking printed on the inside of the top flap reads “Decize” which is a town in France. 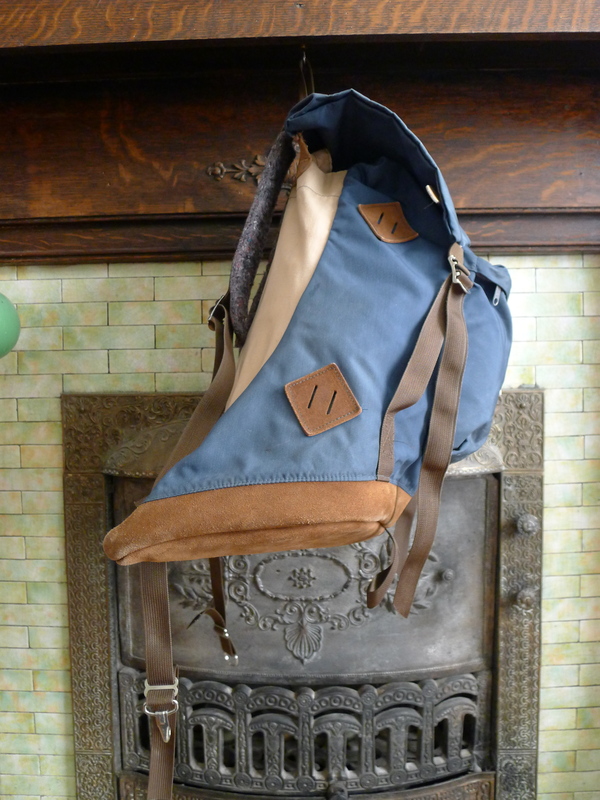 The pack is made of heavy-weight Grey canvas with black leather trimmings and fittings. 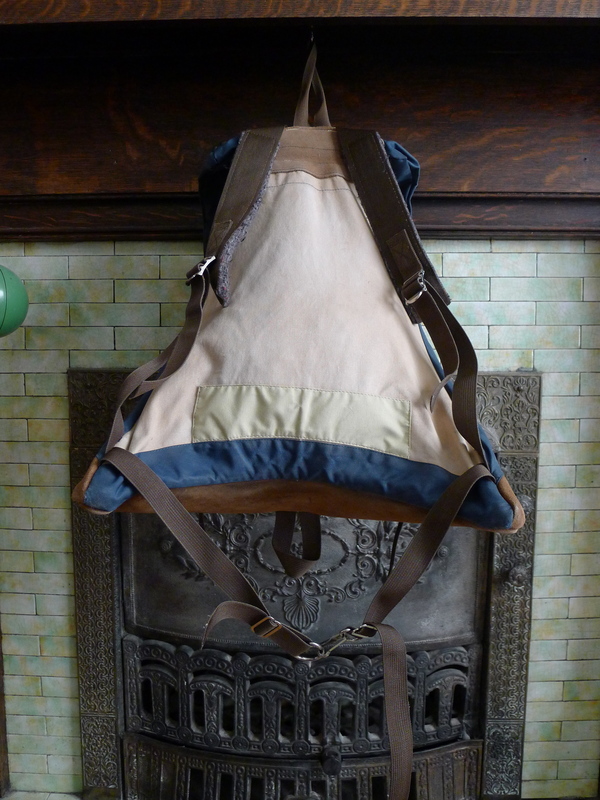 The pack itself is very wide at 19 inches across the back, expandable by a few more inches via lace up expansions on the back sides. 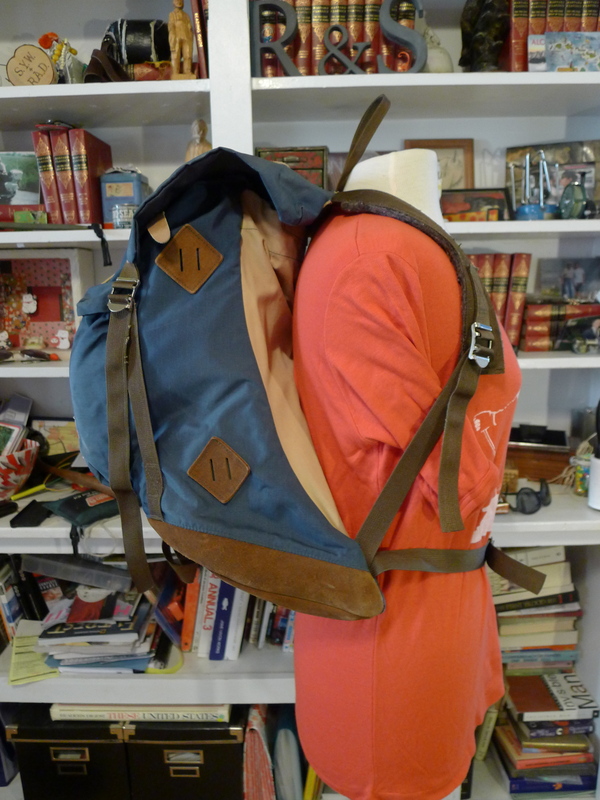 Two large cargo pockets on the sides and one front pocket all close via leather buckles. 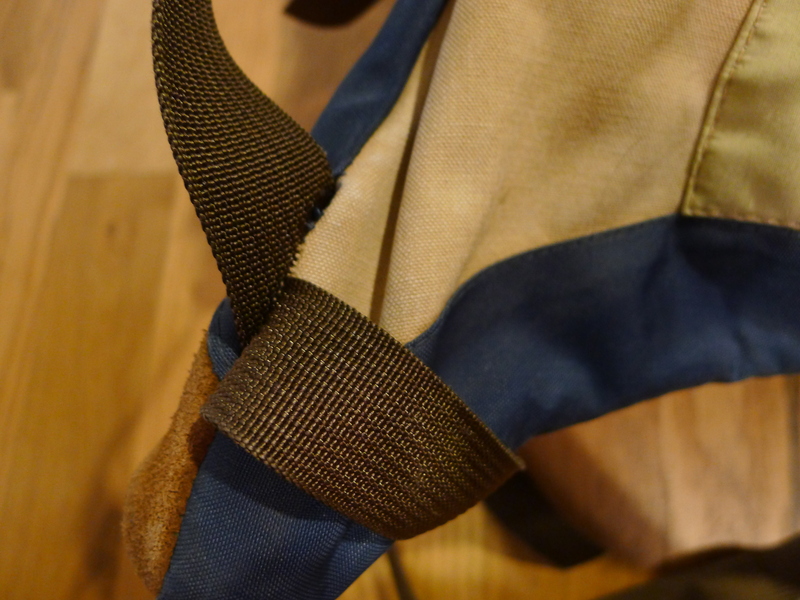 A draw string closes the top underneath a double buckle top flap. 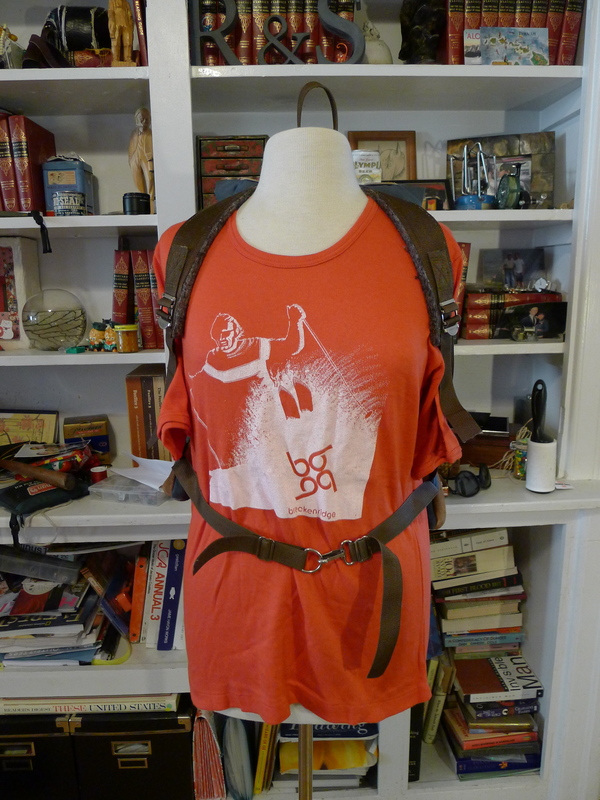 Finally another long leather belt runs from the top and buckles to the solid leather bottom. 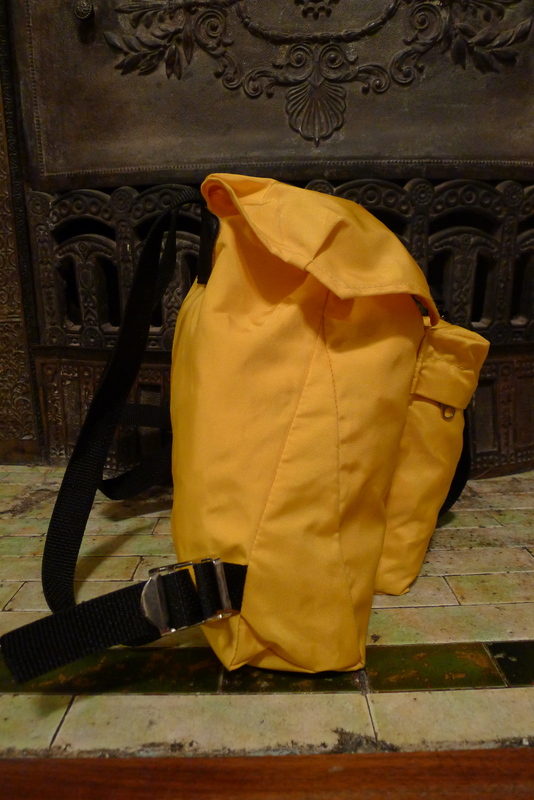 Shoulder straps secure a metal external frame. The straps are adjustable by multiple buckles which create tension on a lower cross strap at the hips which keeps the frame from resting directly on the back. 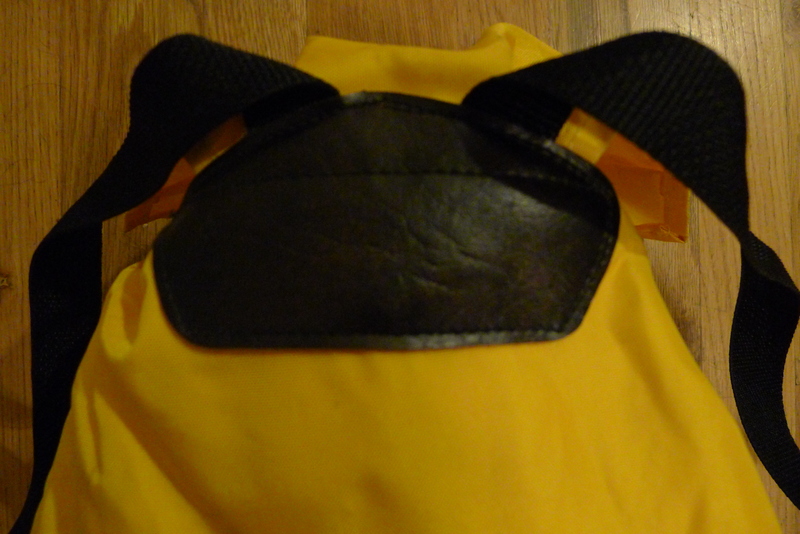 About a half inch of felted wool makes up the shoulder strap padding. 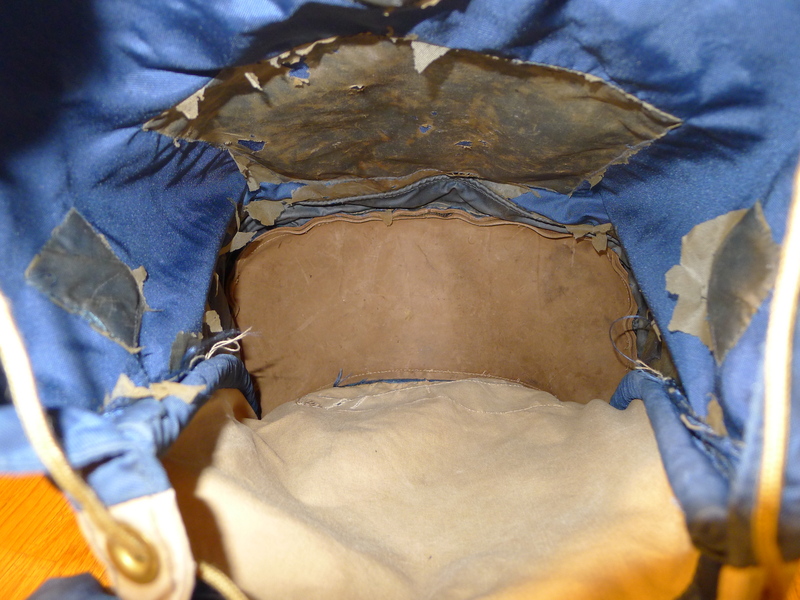 One of the straps is breakable, a technique common to military packs allowing troops to slip out of them while in the prone position. This bag is constructed of heavy duty green and white military canvas with leather and metal fittings. Thick leather straps are adjustable by buckle at the bottom for length; and at the top for slack from back plate. Both straps are anchored at the top by a large D ring. The left strap is hinged by a metal pin half way down, while the right is breakable by way of a hook and ring. Not sure what this was for, possibly ease of exit from a loaded pack, or to allow for strap accessories. 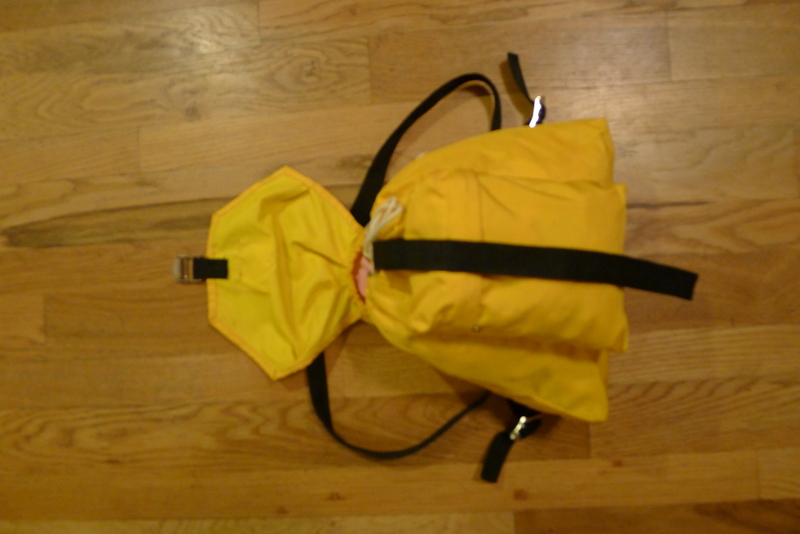 Two rods running the length of the back panel give the bag rigidness. An inch wide metal bow at the bottom of the bag is spanned by a cotton strap to offer padding and breathability at the waist. 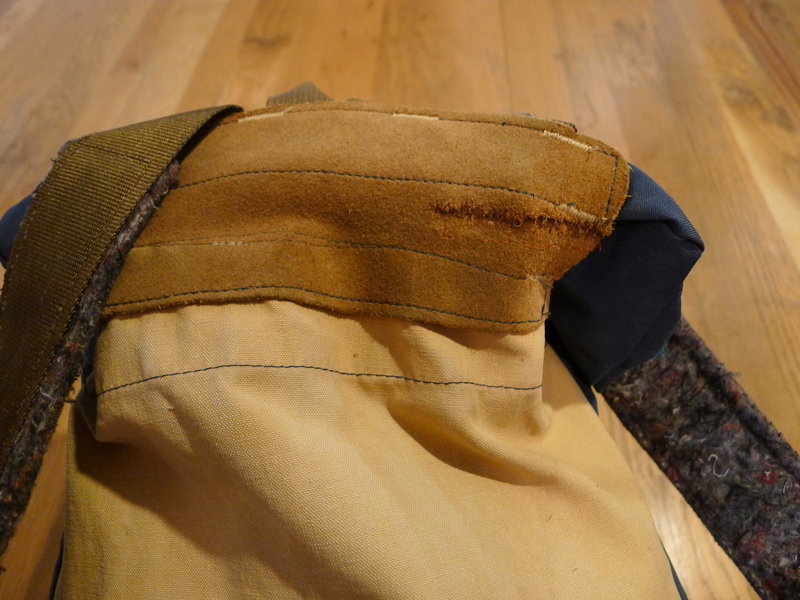 Top closure is completed by a cotton draw string through aluminum grommets and a canvas flap secured by leather straps. 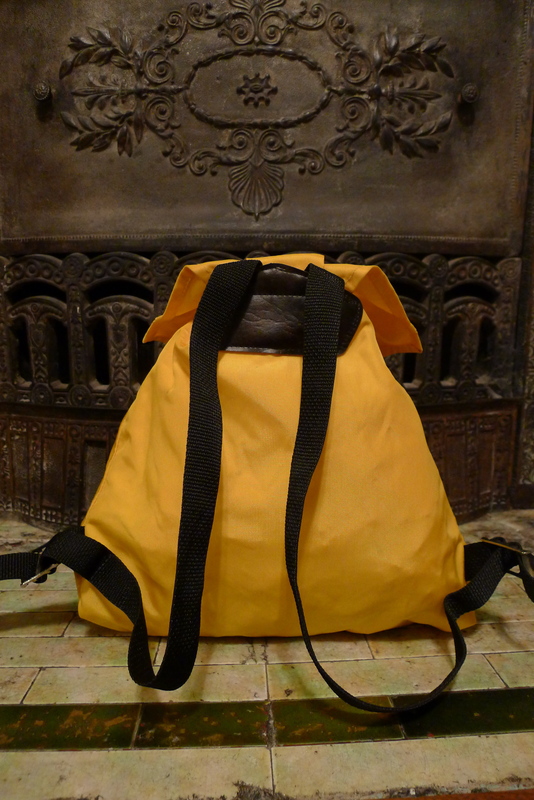 There is also an internal gator with cotton tie cord to further secure contents from the elements. 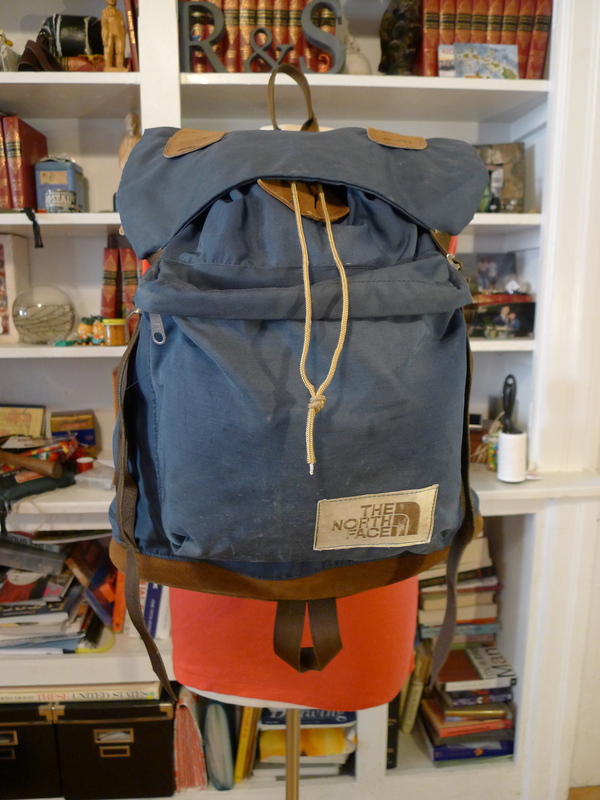 One external pocket on the front of the pack is also secured by leather straps and metal buckles. 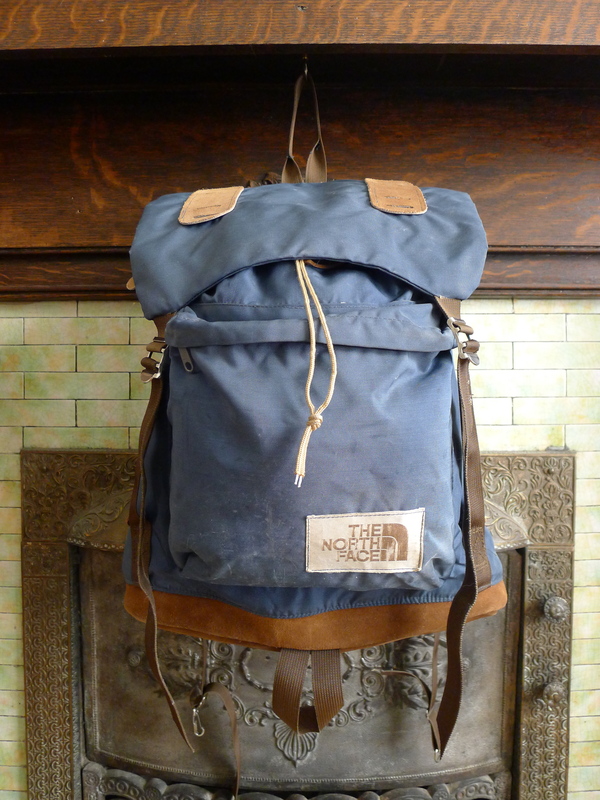 This pack is sold with two original lashing straps to secure goods to the top flap via metal loops. 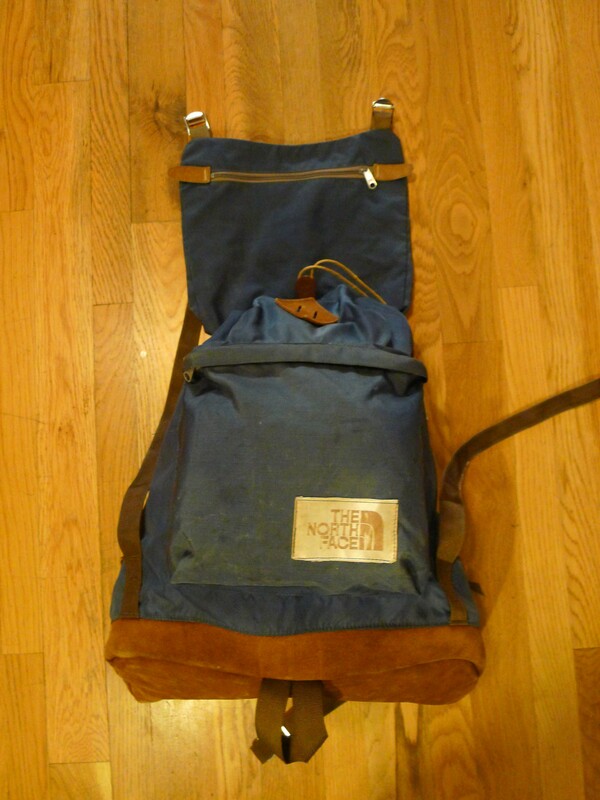 Soldiers returning from WWII who took up mountaineering as a hobby and sport used packs just like this early on. 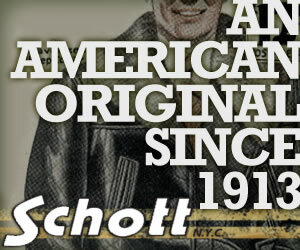 These designs were later taken and adapted by outdoor companies for use specifically as outdoor products. 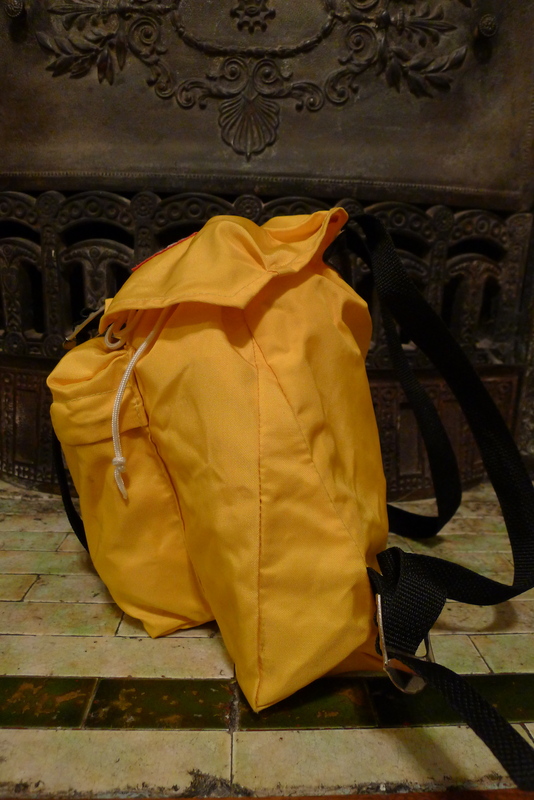 The designs of many early packs from companies like Gerry, Class 5, The North Face and Kelty can be seen in this pack. It is a great piece of military history and outdoor history. This bag has three compartments, one main, one front and a top compartment on the flap. 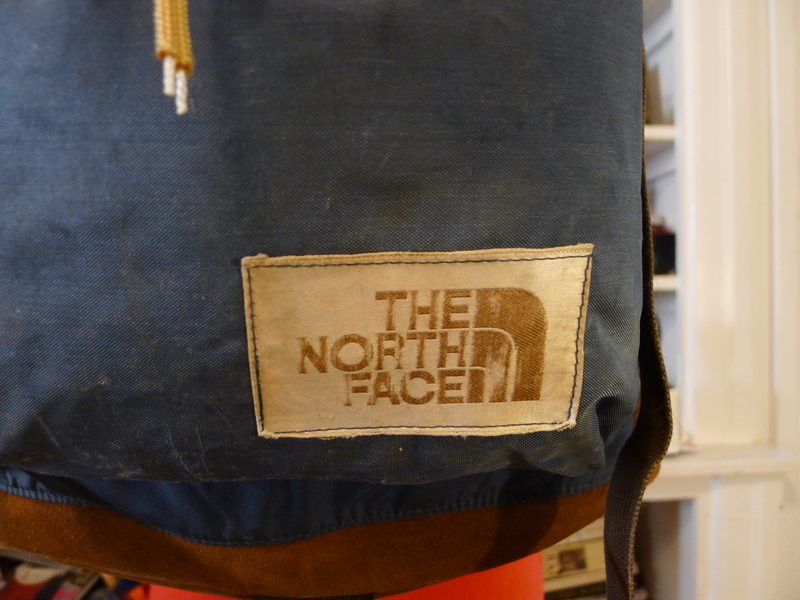 Class-5 was is California-based outdoor gear company founded in the early 70s by Justus Bauschinger a designer for Trailwise and The North Face. The company was known for their innovative designs and marketing.